Sauropsida includes most of what was clasically known as "Reptilia" along with birds which are in effect glorified reptiles) and of course dinosaurs. Sauropsids therefore are the bulk of the reptiles plus birds, while Synapsids are the "mammal-like reptiles" plus mammals. The first Sauropsids were probably primitive lizard-like creatures rather similar and fairly closely related) to the protorothyrid Hylonomus, shown at right. They scurried through the Carboniferous undergrowth. 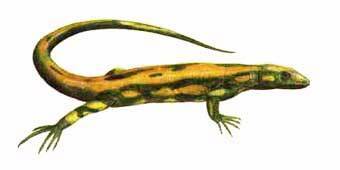 In appearance and behaviour they would have been similar to modern lizards, although anatomically they were more primitive. At this time, the world was ruled by stem tetrapods. The only other amniotes around were a few basal synapsids. Both groups underwent a rapid evolutionary radiation as the Carboniferous and Permian proceeded. The synapsid "pelycosaurs" grew into 1 to 3 metre long predators, including specialized fin-back forms and two herbivorous lineages. The sauropsids remained small and lizard-like. Thus the dominant life-form during the Permian were synapsids, and, during the Late Permian, the therapsids which evolved from them. The end-Permian extinction, which saw off 95% of lifeforms on Earth, decimated both synapsids and sauropsids, but the sauropsids came back faster, with creatures such as the crocodile-like Proterosuchidae. These sprawling predators were the advance guard of a great army of scaly and armoured carnivores and herbivores (the Archosauriformes , as well as the dinosaurs, during the Triassic period. Meanwhile the Triassic seas were the home of a variety of Sauropsid marine reptiles - ichthyosaurs, nothosaurs, and thalattosaurs. During the Late Triassic period the dinosaurs well and truly took over. The Synapsids were reduced to the role of mouse-sized rodents and insectivores; the mammaliforms and mammals of the Late Mesozoic. They remained in that lowly station, sharing the microvertebrate niches with a variety of lepidosaurs (lizards and lizard relatives), until a huge asteroid saw off the dinosaurs and the marine reptiles (the terminal Cretaceous extinction event) and the mammals were able to inherit the Earth. The surviving sauropsids include turtles, lizards, crocodiles and birds, all of which are still around today. The crocodile-like Choristodera were a major group (order) of reptiles that survive the terminal Cretaceous extinction but became extinct before the modern era, while the sphenodonts, the "lizards of the mesozoic" one could call them, are represented by a single endangered species on a few small islands off New Zealand. Sauropsida: All amniotes closer to snakes than to St. Patrick. Little or no specialization along tooth row; $ maxilla separate from quadratojugal; $ single coronoid; some suborbital fenestra present; $ supinator process parallel to humeral shaft; $ 1 centrale in ankle; tail-based locomotion using lateral undulation; frequently bipedal; no glandular skin, uric acid waste, beta keratin. Links: Phylogeny and Classification of Amniotes; Taxonomy browser (Sauropsida); Lecture 8 - Tetrapods; Amniota. ATW010219.